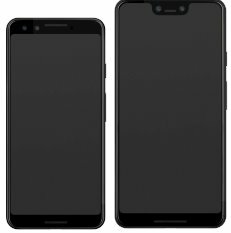 The popular and consistently accurate leaker evleaks has tweeted a set of renders that match what many people now think of as the Pixel 3 and 3 XL exactly. The larger of the two phones persists in exhibiting an honestly colossal-looking notch. It appears Google is conclusively out of surprises for its next smartphone launch event. It seems at this point that we know everything there is to know about the upcoming Google launch event, even though there is still a couple of weeks to go before it even begins. It is likely that the Pixel 3 and 3 XL will be powered by the Snapdragon 845 chipset, at least 4GB of RAM, 64GB in internal memory, dual front-facing speakers and no headphone jack. In this way, they are much like their predecessors, the only main difference of note so far being the dual front-facing cameras present in both models. This feature has been corroborated again by the prolific leaker Evan Blass. He has tweeted renders of two phones conforming to these rumors, apparently in response to popular demand. The larger of the two devices in the image also features the as-expected notch. Again, it is large enough to accommodate the two cameras and one of the two speakers (smaller than the one on the other end) in an almost face-like conformation. Blass has built up a demonstrable reputation for accuracy over the years. On the other hand, this leak contained no references to the Pixel Watch, a new product that Blass has previously suggested would drop along with the next-generation Pixels. Nevertheless, it's looking more and more likely that the next Google device launch will not be very newsworthy at all.